Kiam Yoong initially made contemporary furniture as a hobby. He was later inspired by the book entitled Classic Chinese Furniture by Wang Shixiang and was overwhelmed by the beauty, elegance and intricacy of the pieces presented in the book. After that moment he was determined to utilise his woodworking skills in recreating the beauty, elegance and intricacy of the pieces presented in the book. Kiam does not believe in pure reproduction but rather, the inspiration and commitment to the classical Chinese furniture style laid the path for Kiam to utilize his skills in bringing the designs to life. The recreation of this past grandeur is his ultimate goal and each piece is unique from wood selection to the construction. Untrained in furniture making, Kiam learned the art from reading books, scrutinizing antique Chinese furniture, and by restoring pieces brought to him. In this way he is now able to reproduce classic Chinese furniture that is authentic in style and construction, free from any influence of the present reproduction Chinese furniture industry. In 1991 Kiam emigrated to Melbourne, Australia and found greater fulfillment in his creations, fueled by the wide range of beautiful local and imported timber and the availability of tools. 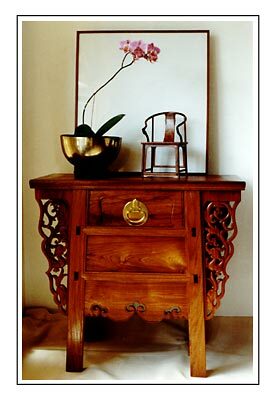 He has since created pieces that would be considered as being of excellent standard as that produced during the Golden Age (Ming and early Qing Dynasties) of classical Chinese hardwood furniture. He has gained recognition demonstrated through commissions, news reviews and major awards.